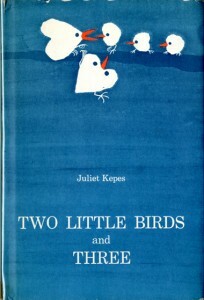 Juliet Kepes (1919-1999) – painter, illustrator, sculptor and children’s book author Juliet Kepes (née Appleby) was born in London. 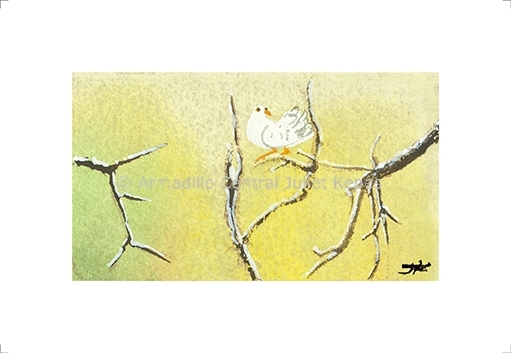 She studied at Brighton School of Art in the late 1930’s. 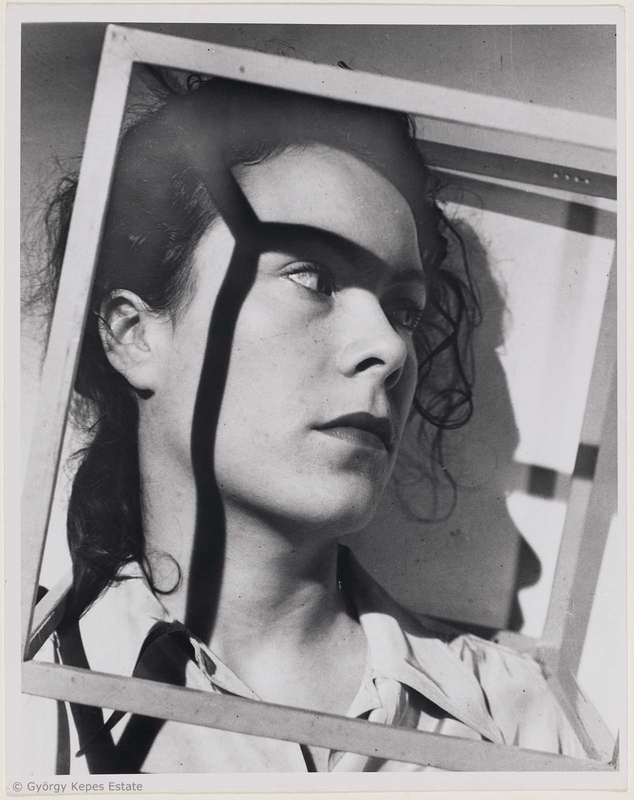 In 1936, aged 17, Juliet met the Hungarian artist György Kepes by chance, on a London street. They married and moved to America a year later so that György could take up a position at the ‘New Bauhaus’, subsequently known as the Chicago Institute of Design. The couple later settled in Cambridge, Massachusetts where they collaborated on several art projects, including the well-documented playroom for their children, recreated in part for the Century of the Child: Growing by Design, 1900-2000 exhibition at MoMA, NY, in July 2012. 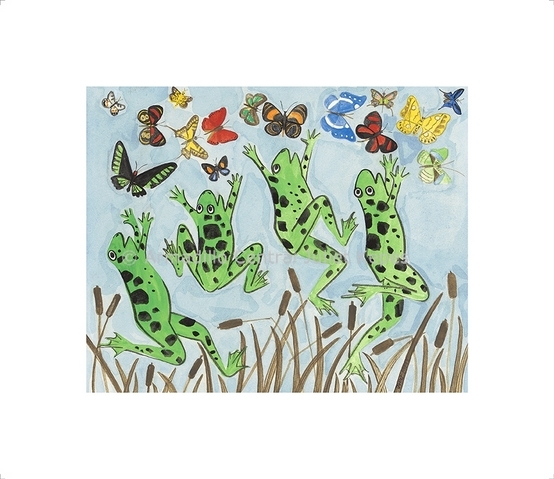 They also worked on murals in schools and libraries including a set of bold enamel art panels for the Morse School’s hallway, installed when it was first designed and built by their friend the architect Carl Koch. 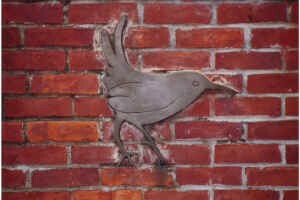 Juliet’s five bronze birds, commissioned by the Cambridge Arts Council, still fly on the brick walls of Clarendon Avenue Park in Cambridge where she lived for over 50 years. Juliet became best known as an author and illustrator. Her first book Five Little Monkeys was published in 1952. In 1953, it won the prestigious Caldecott Medal, awarded annually to the artist of the most distinguished American picture book for children. 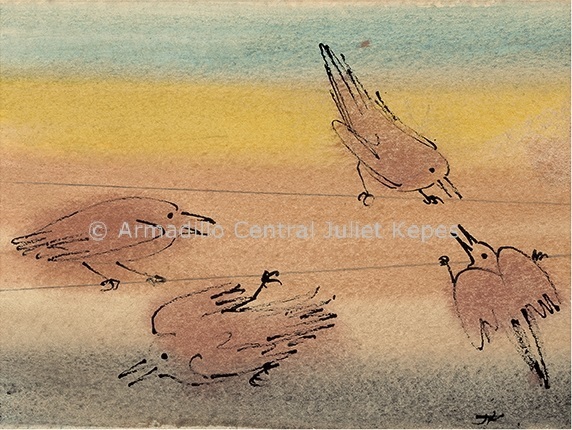 Her artwork was particularly recognised for its original use of colour and for its expressive and often calligraphic qualities. 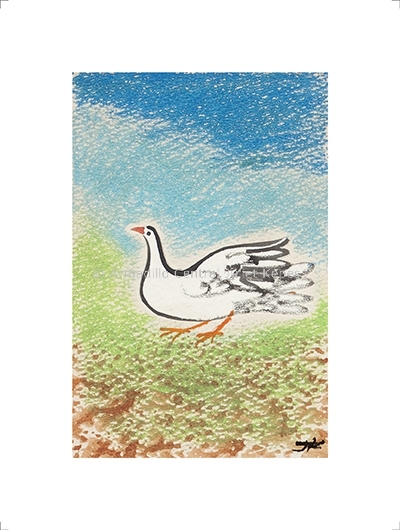 Her bold, at times spare and at others painterly, use of colour and tone and the sheer economy of line in her art are clear signatures: masterful and minimalist at once. 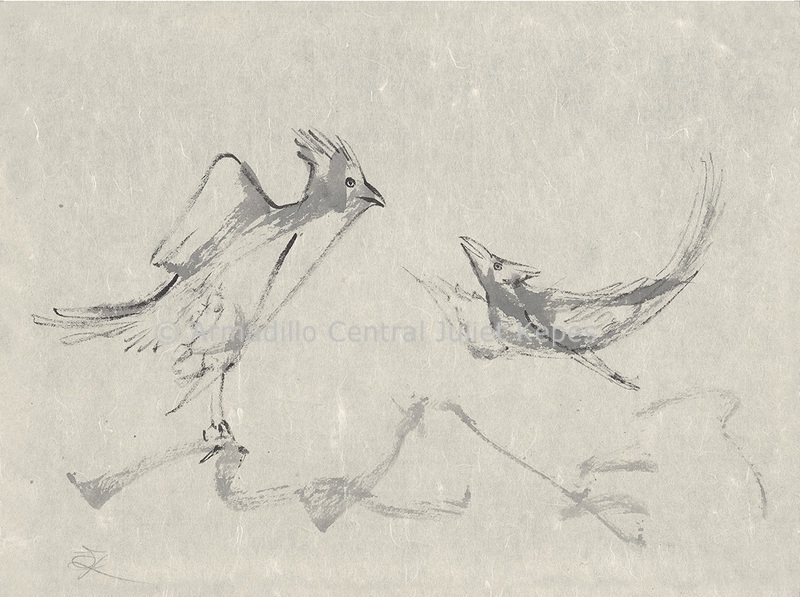 Some artworks have a distinct Japanese feel, also evident in written work such as Birds and Beasts from a Brush, both reminiscent of the haiku style. Her stories are simple, engaging and elegantly executed, and just like Juliet was, witty, full of warmth and compassion: “In my books I try to give children pleasure and some information about the creatures around us… Good children’s books are for everybody.” Indeed, although primarily targeted at children, her books have an enduring appeal for all ages as do her wonderful illustrations. 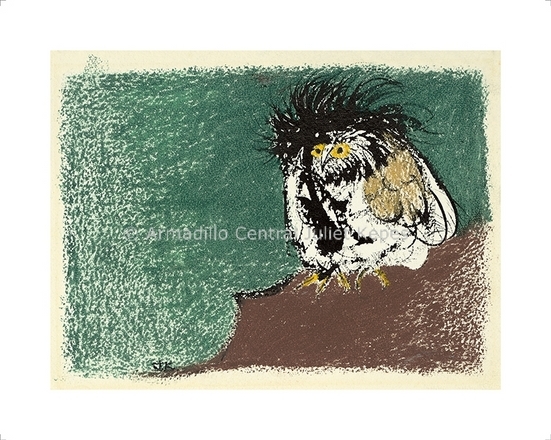 As well as her own work, Juliet illustrated books for William Jay Smith (Laughing Time, 1953, Poems: 1947-1957, 1957; Boy Blue’s Book of Beasts, 1957 and Puptents and Pebbles, a Nonsense A B C, 1959), Emilie Macleod (The Seven Remarkable Bears, 1954) and Herbert Read’s selected poems for the young, This Way, Delight, 1956. In 1962 she received a citation from the Society of Illustrators for her book Frogs Merry (1961) and Lady Bird, Quickly was listed as a New York Herald Tribune Honor Book in 1967. 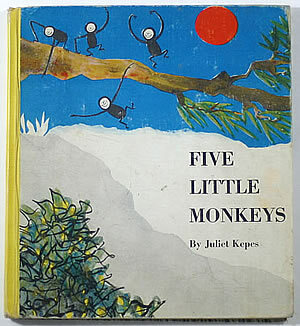 Four of her other publications were nominated for the New York Times’ Ten Best Children’s Books of the Year: Five Little Monkeys, (1952); Beasts from a Brush (1955); Two Little Birds And Three (1960) and Birds (1969). 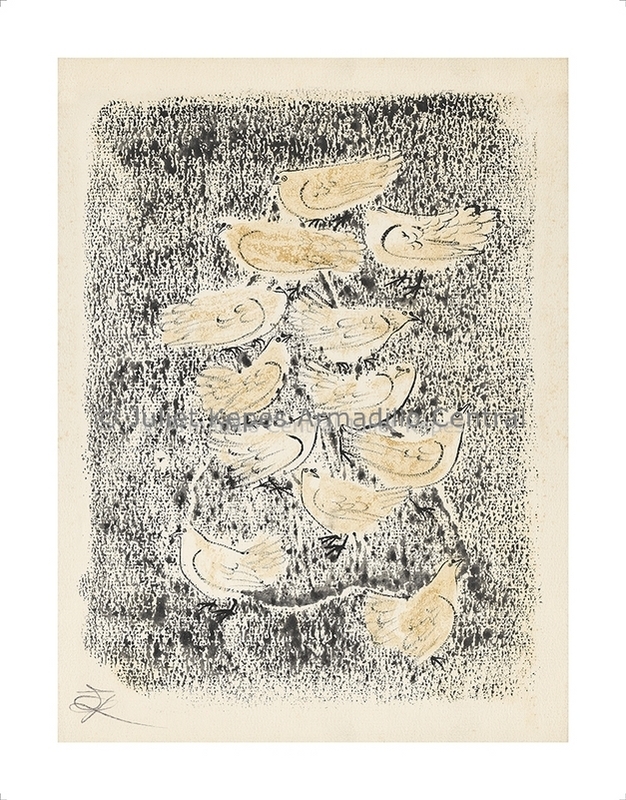 Her drawings and paintings were widely exhibited, including shows at the Art Institute of Chicago, Baltimore Museum, Worcester Museum and the Gropper Art Gallery, Cambridge, Massachusetts. 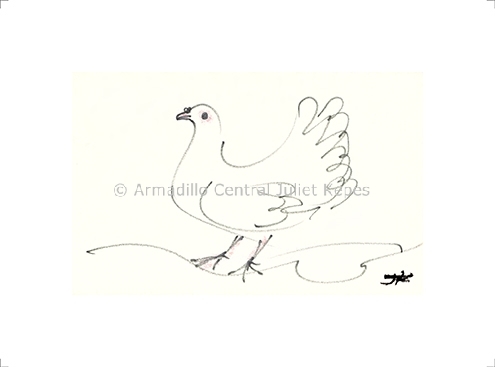 Juliet’s prolific output included beautifully illustrated letters, regular hand-drawn Christmas and other occasional cards as well as one-off pieces sent to family and friends to mark important occasions: births, marriages, new homes. 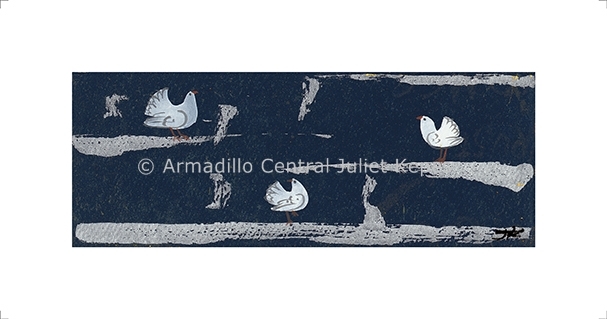 We have been fortunate enough to be able to reproduce some of these works, which form the current Juliet Kepes collection at Armadillo Central. 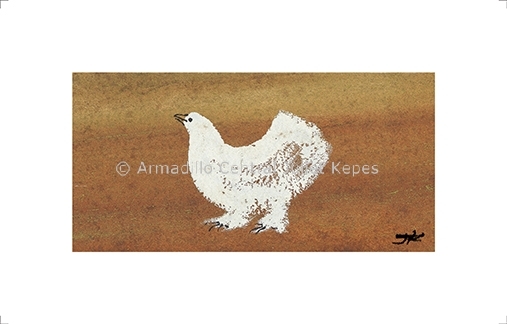 These include prints on 310 gsm Hahnemühle fine art paper using archival inks. 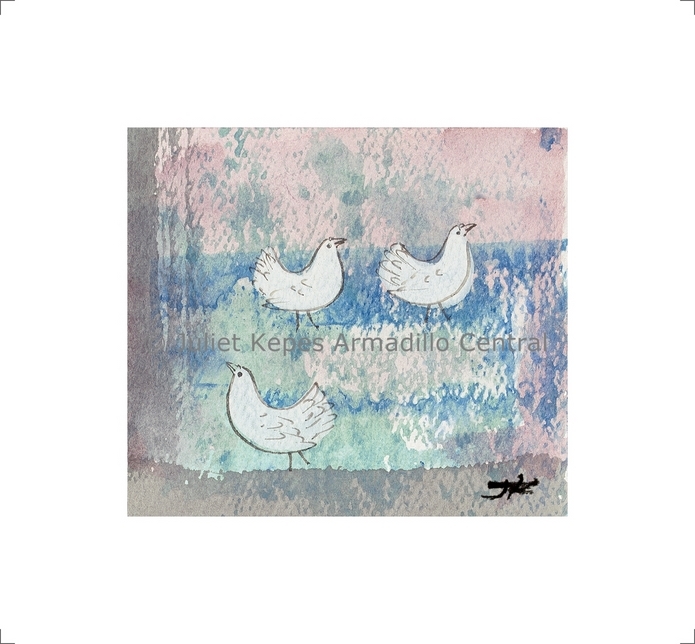 We also have handful of cards designed by her. Email us for further details.